Just a week ago the the P5+1(+0.5) and the Islamic Republic of Iran signed a deal to limit the IR of Iran’s nuclear facilities, production capabilities, and potential to develop a nuclear weapon / limitations on the potential to have a nuclear weapons programme. To celebrate this agreement, I would like to offer a photo of The Holy Diamond, a quick assessment of the agreement, and finally a creative touch to wrap it all up. Just a note, the P5 are the five permanent members of the UN Security Council, the One is Germany, and the 0.5 is the European Union. It means that basically three countries (UK, France, and Germany) get double representation… Now is that fair? Did you ever hear of the SALT I, SALT II, START I, START II, and New START Treaties? These are all nuclear weapons treaties signed between the US and USSR and then US and Russia. Not all of them were ratified. But some of them were or otherwise they were respected without ratification – and they all included the USSR/Russia keeping nuclear weapons. And not just one or a dozen, but thousands! If you think the Iranian deal was bad, then how does the US-USSR/Russia deal sound? The Holy Diamond Now (Finally) on iTunes/iBook! 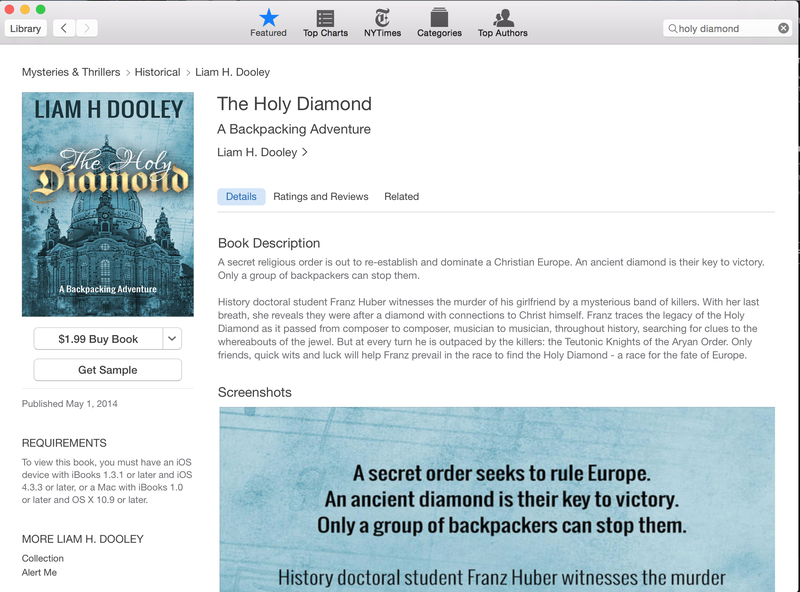 The Holy Diamond is now on Apple’s iTunes and iBooks! It took me ages to figure out the correct formatting, the uploading process, and all that dull, administrivia stuff but it’s finally done! All you have to do is search iTunes or iBooks for “The Holy Diamond” and it will come up on your results page (as below). BUT be sure you are registered in a country / iTunes account that allows ebooks/iBooks. Not all of them do. Don’t ask me why… welcome to Apple! Thanks to all my friends, family, fans, supporters, and readers for your encouragement! I have owned the MacBook 12 inch retina for about two weeks, with moderate use. I want to give you an honest review that is more than just a critic or expert looking at it at an Apple conference or posting their review 20 minutes after taking it out of the box. The summary? This is not a good computer for most people, and Apple basically screwed up. But it’s not the worst product in the world either. I owned a 2012 MacBook Air 11 inch and was looking to upgrade. The Air was declining in processing power, battery life, and its 128 gb hard drive was inadequate for 2015. And I just wanted a new computer. So what to get? Well, if you don’t want a Mac, then this eliminates all of the computers I was looking at. I was trying to decide between either MacBook Air, this MacBook 12 inch, and MacBook Pro 13 inch retina. But what were my requirements? Well, what I can say is that in my 3 years or so of using the 11 inch MacBook Air I never said, “I wish this was smaller!” The Air was a good size and, in fact, closer to 12 inches rather than 11. It easily opened up on planes, easily fit into any bag, and was light enough while being so hard and rigid that it could easily take a moderate beating. What I needed in particular was more battery life and better resolution. And cost was not an issue. I am not a conspiracy theorist. I believe that terrorists and al Qaeda attacked the USA on 11 September 2001. I am certain that while the US had strategic warning about an imminent attack by Japan in 1941, they were operationally surprised when the bombs fell upon Pearl Harbor. I don’t think some bizarre combination of the CIA, mafia, military-industrial complex, and aliens assassinated President John F. Kennedy. I am firmly convinced that there is no Illuminati nor freemason society running things – anymore than the world is influenced by powerful people of all types and forms in very public ways such as campaign donations, government lobbying, charitable donations, and the like. So when I first read about Seymour Hersh’s article that the May 2011 killing of Osama bin Laden by US special forces was largely fabricated or altered by the US and Pakistan, I greeted it not with just scepticism but outrage. How could such a reputable and accomplished journalist publish a story that could have come straight out of the Republic of Texas or a bad season of 24? But then, I started thinking. Let me say that I have never been in the military, though I have worked for military and security organizations as a contractor, consultant, appointee, etc. I have never planned a major military operation, and my shooting skills have gone from passable at best to embarrassing. But as a writer of fiction who hopes to write about modern warfare, I have thought about military issues extensively. At one point I had a focus on World War Two, but now it is fair to say I am more familiar with present-day operations thanks in large part to extensive coverage of the wars in Afghanistan and Iraq in the form of TV documentaries, news pieces, books, and even films. I can watch films and guesstimate with some accuracy the good and the bad; the fabricated and the authentic. A sniper running around in gym clothes in Behind Enemy Lines? Utter nonsense. Needing to make a phone call to call in air support over a telephone? Not only possible, but happened and will likely happen again (at least to some military, not necessarily the US military as had happened in Grenada, 1983). 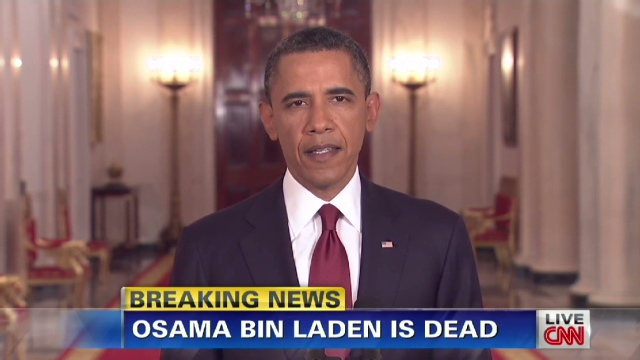 I saw Zero Dark Thirty and read a few books on the bin Laden raid, such as Mark Owen’s No Easy Day. The film captured the nature of intelligence collection and analysis – what President George W. Bush referred to as connecting the dots. The book related the intensive training and operations that US special forces were engaged in during the wars of the past fourteen years. The hunt for bin Laden, in these books, was a long, patient effort that required luck and perseverance and, indeed, did not necessarily figure as a priority in intelligence or policy. Yet even when the raid occurred, and some US Republicans were criticizing President Obama for taking credit for the operation and also claiming that the decision to conduct the operation was easy, I had some fundamental questions of operations and policy. So the Liam Blog and The Holy Diamond have been on a bit of a vacation for some months, mostly working on new creative writing efforts and traveling. 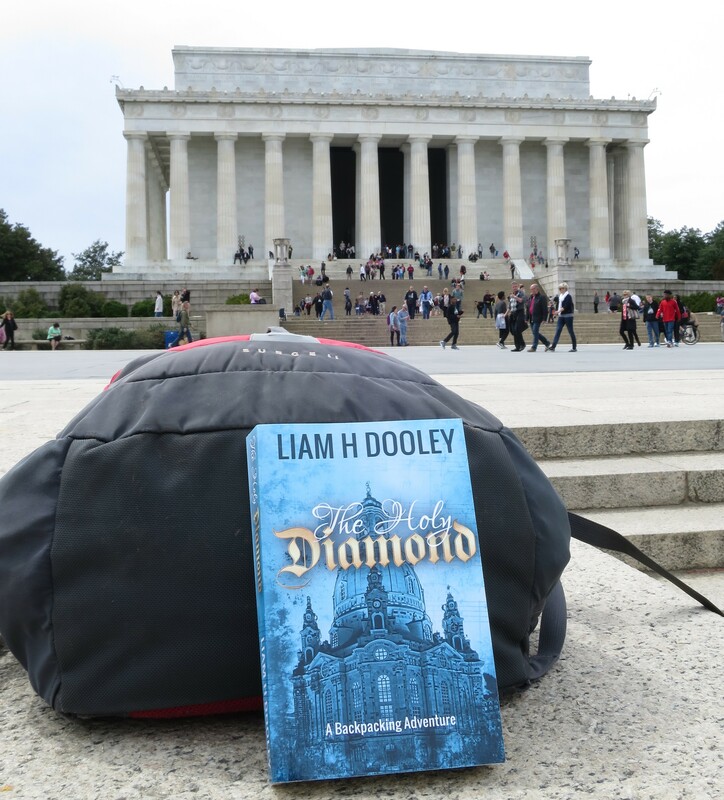 News on new writing projects will come soon, but in the meantime here are a few photos of The Holy Diamond‘s latest travels to Washington, D.C., USA. No White House photos due to security reasons. I won’t waste too much space with thoughts about this city… it is pretty much over-covered in film, television, news, and history books. It is NOT, I would say, well covered in literature classics or novels. At least not ones that I know. Of course, there are probably hundreds of novels that have involved the city – its espionage, its intrigues, and its politics. But not any great classics come to mind. There is no Hunchback of the Washington Monument, or FBI Agent Sherlock Holmes. A recent, reportedly mediocre novel (that I did not read) is Dan Brown’s The Lost Symbol. From what I can gather it is basically one of the four or five stories of the same theme: running around looking for some clues to evade death, all within about 24 hours. I had once considered writing a novel that took place in this city – more along the lines of Les Miserables than House of Cards. But in the end, I stuck with my preference for stories that take place in Europe, and that is what we have to date. One can and one does spill ink daily about this city – just pick up the Washington Post. My view is that this city is rather more stagnant than Paris or London, but it has some nice museums and sites to visit – for free! My favorites include the Smithsonian Air & Space Museum, the Lincoln and Roosevelt Memorials, and the National Archives. In the latter one can see the faded, beat-up copies of the original Declaration of Independence and Constitution, as well as a rotating display of other great, historical documents. One will most likely see many of the symbols of the city’s political elite: motorcades, Presidential helicopters, press pools set up somewhere, and of course the dozens of massive, classical government buildings. Most of these, however, are not open to the public – especially the White House. It’s too bad, because it makes my photo of The Holy Diamond on the President’s desk in the Oval Office a bit tricky to take. Cherry Blossoms, Tidal Basin with the Washington Monument in the background. Cinque Terre, Italy, is a seaside mountainous area of Italy on the boot’s upper west side, south of Genoa and north of Rome. I recently went there to discover the villages (officially five), the landscape, the sea, and wine. I went in search of inspiration and new writing ideas to take a break from the business end of creative writing, and I was not disappointed. I did not know at the time that the Cinque Terre made its own wine – a good mix of reds and whites. They are not like my preferred Bourgogne, which use pinot noir almost exclusively, but use a local Italian grape. The wines have a heavier, new taste compared to Bordeaux, yet are much less fruity than Bourgogne. One fine bottle of wine I drank was in La Spezia – the nearest city to the Cinque Terre with a good number of affordable – and available – hotels. This Ombra bottle was served at an outdoor terrace on the main city square. La Spezia itself is an unremarkable city, but practical to go to the Cinque Terre by train or boat. Here are some more red wines from the area – these on sale at the Cinque Terre tourism office of La Spezia Central Station (or La Spezia Centrale). 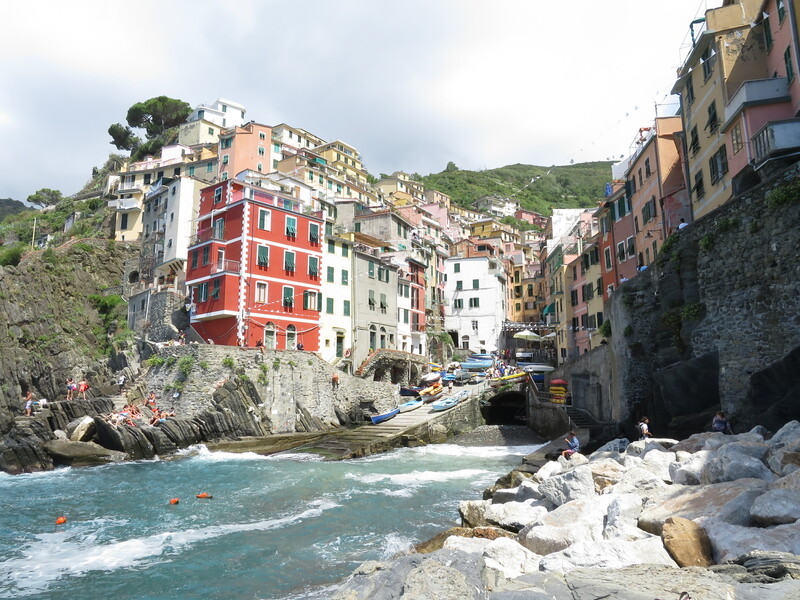 In a paragraph or so, what is Cinque Terre like? It’s composed older looking villages with colorful trim and shudders, sometimes bright facades – though shades of cream are the predominate palette – built into the mountains that rise steeply from the sea. The buildings and their vineyards are terraced, some of both rising from sea level up to over a hundred meters in a short distance where stairs sometimes reminiscent of Frodo and Sam’s ascent into Mordor become much more efficient than roads. During my visit the seas were so rough that boats could not run between the villages, and not without reason. The waves crashed into the dock areas and along the rocks, thundering and foaming beneath these beautiful villages. Each village had its disproportionate share of restaurants and cafes, as well as scenic overlooks, churches, and in some case forts. I’d like to say that in my travels I’ve seen some of everything, but the Cinque Terre was truly a remarkable and unique site. The next question is…was it inspiring? The quick answer is…. Yes! How so? Well, with the steep mountains lush with green trees, bushes, and grape vines; with colored, Renaissance buildings pressed between water and rock; with the smell of deep fried sardines mixing with sea salt: how could one not be inspired? A dozen stories could leap to my mind: an alien invasion from the sea, a shipwreck in the age of the Barbary pirates, a crime thriller, a World War Two adventure, or yes… even a backpacking adventure! But time will tell what I come up with, if anything. But in the meantime, the wine will always be there. After a long absence from blogging and doing anything novel related, I am back in business! So you can now shower yourselves with ceiling-dropped balloons and safely toss about firecrackers in celebration. Where was Liam? You might (or might not) ask. Liam decided that after many years of living and backpacking through Europe, it was time to relocate. So now I am in Southeast Asia! Photos to follow of the new home, but here is a farewell from Europe, this one taken from one of my favourite writing cafés in Lyon, France, along the Saone River looking up towards Fourviere hill. So what is new in the world of writing, wine, and wandering? Well in the world of wandering, there are new places discovered in Asia, but more about them in the future. Wine is expensive, especially compared to Europe. And writing? Aspiring and actual writers go through a hundred or more steps. From inspiration to world fame and multi-millionaire status (or so we all hope), but with so much in between. Each step seems more difficult than the last one – and more tedious! For The Holy Diamond, I am on the difficult, hard-working, and slow progress step of “marketing”. There are many challenges to marketing. One is keeping up the energy to do it. Another is doing it with some sort of strategy and plan, and being patient enough to follow it. When I meet people on my backpacking adventures I tell them about The Holy Diamond, and many of them look it up. But they, until recently, did not see reviews; which understandably makes them hesitant to invest the time and money into an unknown author/story. But finally, after several months, we have (drum roll…) THREE reviews. It’s a start, and we hope to get more soon. If you have read the novel, PLEASE post an honest review! Share your thoughts! The Holy Diamond was inspired by a lot of themes, including music, Eurovision, Nuremburg, and the Imperial Crown of the Holy Roman Empire. But one of themes I wanted to include was the hostel life. For those who have been to a number of hostels, you have probably noted that they are all quite different. I’ve been to Hiltons, Marriots, Radissons, and other luxury hotels…and the rooms are almost all the same, as well as the hotels overall. But hostels vary as much as clothes or food. I have stayed in at least 100 hostels, I think, through my years of backpacking. It is thanks to these experiences that I was inspired to and able to write The Holy Diamond: A Backpacking Adventure. Based on my experiences, I can tell you a bit about what to consider about selecting a hostel. What you like and won’t like will, like food or clothes, be a matter of circumstance and personal preference. Location. Location is important for any kind of shelter – home, hotel, tent, friend’s place, parking, etc. Most, but not all, hostels are centrally located. In some cities I’ve been to like Utrecht, Netherlands, and Bologne, Italy, the hostels were several kilometers from the city. It made getting back and forth time-consuming and usually meant I had a self-imposed “curfew” in order to not deal with the hassle of a taxi or walking after midnight. In Dubrovnik, I stayed at a hostel that was only 500 meters or so away; but it was 500 meters straight uphill. So once I was at the hostel after a long ascent in 35-degree Celsius heat I tended to stay. Nonetheless, all else being equal, I always prefer to stay in the centre. In Tallinn, Estonia; Nuremburg, Germany; Riga, Latvia; and Split, Croatia for example, the hostels were within the old city centres so that I was able to go back and forth to the hostels between museum visits, meals, and whatever else to take a nap, clean up, or just check out the hostel social scenes. Especially in Europe, my backpacking home base, most cultural and social activities (pubs, bars, clubs, restaurants, etc.) are located in the old city centres. What else is great about being in the old city centre? You often, but not always, get a scenic view, the hostels tend to be more active socially with more backpackers, and you will also be closer to public transportation hubs (bus stations, metro stops, train stations). There is nothing more annoying than arriving in a city and then having to walk four kilometers or figure out the bus or metro to the hostel. What is bad about being in the centre? Anything? Well of course. Almost everything in life except suntan lotion (according to a fake Kurt Vonnegut commencement speech) has disadvantages. City centre hostels are in general more expensive, smaller, dirtier, and MUCH MUCH noisier than their non-centre hostel counterparts. The great noise is because of both the sounds of the city (people yelling in the streets, garbage trucks, traffick, trams, buses, etc. ); and the often party atmosphere within the hostel. One of the “worst” hostels I have stayed in was in Vienna, Austria, center. The room for four was so tight a person could not walk around another. There was no common room, kitchen, and the shower was run down. But the location was good, and the roommates were friendly. WIFI: One other thing I will say about a consideration for a hostel is INTERNET. The internet is a wonderful thing, in part because otherwise I would not have a blog! In many expensive hotels, internet is an additional cost – up to ten dollars an hour, or fifty dollars for 24 hours! Almost EVERY HOSTEL has FREE Internet – that’s both wifi and a free desktop computer (or several)! In a way, not only do you pay less vis a vis a high-end hotel, but you get more! More hostel characteristics to be continued… but to finish, how do you now what a hostel does or does not have? I use the website hostelworld.com. It has detailed descriptions of the hostels they offer, as well as reviews. READ THE REVIEWS! While it is true that one person will say best hostel ever, and another will say worst, you will still get, on average, accurate enough reviews. And hostelworld.com also has some simple ratings that are based on calculated averages. Remember: hostels are not just a place to sleep, but a way of travel! There are three photos below, each from the hostel websites. The Nuremburg hostel is next to the Imperial palace. The Tallinn Backpackers hostel is within the old city, and a seven minute walk or less to the main gate. The Bologne hostel, in contrast, is several kilometers from the centre. Worst, it was hot and filled with mosquitos! When you write a novel, ideally you will write about a place that you know, or at least have been to. Indeed, most authors seem to write their first book or novelette, published or not, about their hometown or home area – unless it’s fantasy or science fiction. There is no doubt that, all else being equal, a writer will write more convincingly about a place they have been to than one they have not. 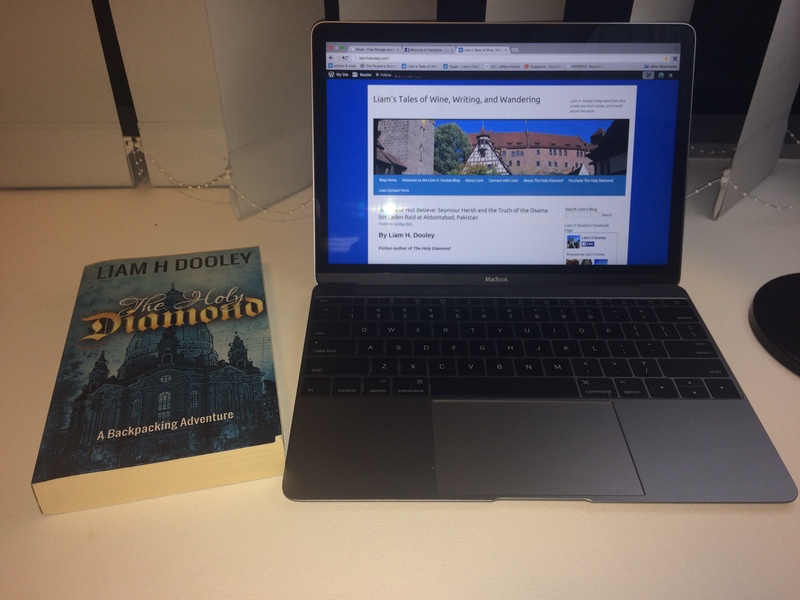 The Holy Diamond has one chapter about Hamburg – but when I had written the first draft, I had not actually been to the city! I won’t go into the tedious details of how I compensated for this lack of experience, but I will say that compared to writing about places I had been to: Vienna, Salzburg, Frankfurt-am-Main, Luzern, and most of the other locations where the novel takes place – writing about Hamburg – even the small area where the chapter takes place – was a challenge. A few months after finishing the first draft of the novel, however, I made my way to Hamburg. First surprise: one of the locations that I had included in the story was closed! But otherwise, the city was quite enjoyable. Highlights included going up the church ruins of Saint Nicholas Church by elevator for a scenic view of the city; a walk along the harbor waterfront; and a boat ride on the two Alster Lakes in the middle of the city. However, the principle area of interest from a novel perspective was a street and neighborhood called the Reeperbahn. The Reeperbahn has, or had, a “seedy” reputation. A place where tourists went for an epic night out, sailors stopped by at night to recover their land legs, and every cutthroat and sell-sword might go to engage in every debauchery and swashbucklery this side of the Atlantic. Today, however, it is a potpourri of everything and anything: KFC, McDonalds, steak restaurants, hostels, hotels, clothing stores, souvenir shops, strip clubs, and a few red light streets or buildings. It’s the old and new (pre and post-Giuliani) Times Square all rolled into one. It is the old Reeperbahn which probably gave the district the best and worst of its reputation. Today it is where everyone goes in the evening: students, tourists, locals, businessmen…everyone who is anyone! It’s the city centre not in the centre. The Holy Diamond has only one chapter devoted to this part of the former Hanseatic city (Hamburg having been a major city of the Hanseatic League). But it is a key chapter, focusing on the Beetlemania museum. 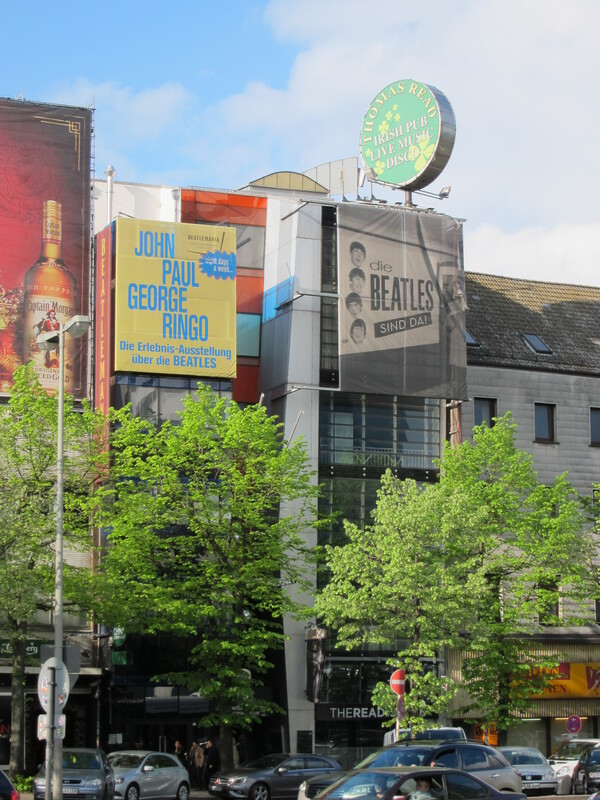 It was only by good luck that, when conceiving the location for this part of the book that involved the Beetles, that I learned that they had actually begun their historic career in Hamburg. Originally, I had planned for this part of the novel to take place in England – specifically Liverpool – but I had struggled with two problems about this. First, getting the characters there; and second, it would be rather far afield from the German-speaking countries in which most of the novel takes place (except for the start of the novel in Vatican City, and a brief return to Italy in the middle of the novel). So it worked out well that I could keep the novel in Germany, while also integrating The Beetles. Moreover, to my surprise and good luck a second time around, I discovered there was a Beetles museum called Beetlemania right in the middle of the Reeperbahn! Thus developed my chapter, and it was only during my visit after I had finished the first draft of the novel that I discovered the museum was closed! 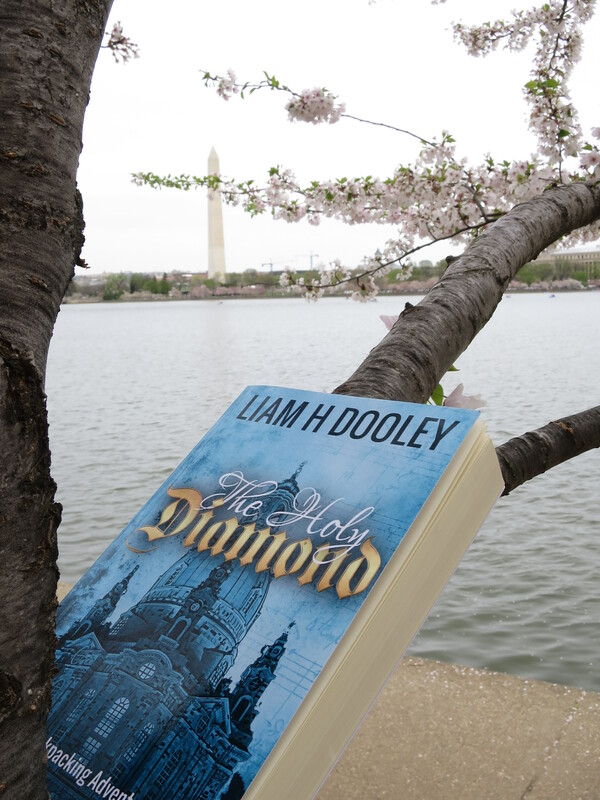 However, it was both too late to change the novel and, after all, it’s a work of fiction and who knows…maybe it will be back, thanks to the success of The Holy Diamond! The Holy Diamond had many inspirations, and one of them is the Crown of the Holy Roman Empire. In my travels across Europe I have seen many crowns great and small. There are the crowns in the Tower of London bereft of their jewels, which had been sold to pay for the Hundred Years War (which the Simpsons called Operation Speedy Resolution…). The crowns of the Kings of France are in the Louvre in Paris. One can see various versions of the Swedish, Danish, Norwegian, Hungarian, and other crowns in their respective capitals. Most are more similar rather than less. Most crowns are, of course, circular. There is nothing within the circle (as viewed from above) or they form a sort of cone. They have a lot of jewels but no images or words. The Crown of the Holy Roman Empire, however, is quite different. Words and phrases run throughout it, either written in pearls or on the plates of the various biblical images. It’s a folding crown: the Ikea version of a crown if there ever was one. It looks a bit sloppily assembled. The images are medieval, meaning that they are disproportioned. The jewels are rough, unshaped, and asymmetrical. Its dimensions are inharmonious. It appears heavily vertical which conflicts with its lack of horizontal lines. But all of these give it its unique look – and must be excused given its age; it was crafted between 980 and 1015 AD. In The Holy Diamond, the crown plays an important role as one of the holding devices of the holy relic, as being part of the history of the Germanic lands, and for being one of the recurring clues as to the diamond’s origins and its present whereabouts. Today, the original crown of Charlemagne can be seen in the Treasury of the Hofburg Museum-Palace in Vienna, Austria. Indeed, in this very room, The Holy Diamond characters of Franz and friends pursue their quest to solve the historical mystery that drives them from hostel to hostel.